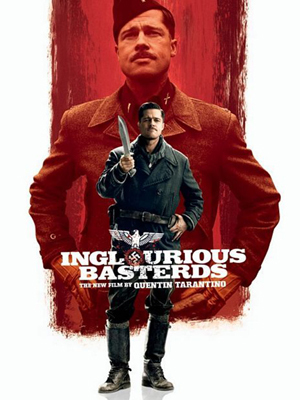 Inglourious Basterds is everything you’ve come to expect from a Quentin Tarantino movie and then some. [firstpara] As if World War II wasn’t bloody violent enough, the video store clerk-turned-director splashes the source material with more of the red stuff, and treats it with even less reverence, making the film a supremely entertaining romp that hits hard and cuts deep. As is Quentin’s tradition, Inglourious Basterds indulges in getting deep into a character. Quentin never hesitates to explore nitty-gritty character details in little segments that branch off, off the main plotline. In Inglourious Basterds, he does so with aplomb. Quentin obviously knows that it is these little details that catch our attention. The film follows a pack of Jewish-American soldiers led by the ineffably charming Aldo Raine (Brad Pitt) on a quest to do unto the Nazi what most of us would want to do as well, that is, to exact revenge like a beast unchained. The “Basterds,” as Aldo’s group is called, aren’t exactly the end-all, be-all center of the film’s plot though. Unfolding over the course of the film is a wild, wild web of characters entangled in their own quests of surviving/manipulating/getting ahead of the rest of the competition.